Thanks to the prodding of several (you know who you are) I am today sitting again at the computer. The six month (yikes! nearly nine month) hiatus really wasn’t planned. It started simply enough. We came home from the mountains deciding it was time to start some major updates to our home and well, one thing led to another and before you know it it was spring and now it’s already summer again. If you are a homeowner there is always work to be done. 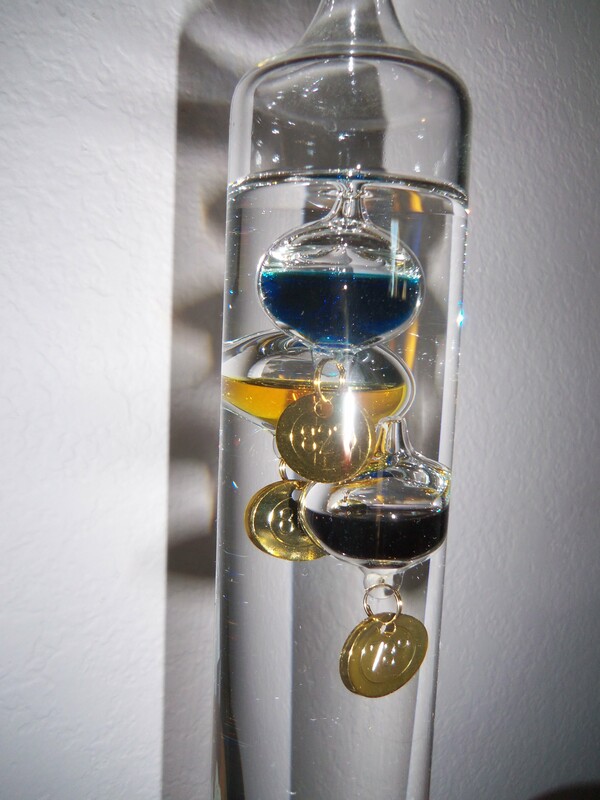 As you may remember, I think life is like a Galileo thermometer. Projects percolate up to the top as a priority just like the temperature bubbles do in my thermometer. For some reason last fall the project bubbles filled all the available space. It started with the fact that I NEEDED to get rid of the popcorn ceiling in the house. “Why?” you ask. Well, it’s those darn DIY shows we keep watching: Popcorn ceiling out of date. Clean smooth ceiling up to date. I blame the DIY channels. Curse you HG TV for planting all these ideas in my mind. But I digress. I will write about the popcorn ceiling project soon. I have pictures. It something you can do. This winter we also made the huge time investment to train the new dog. There will be pictures and hopefully some good descriptive visuals of that little beagle Sophie going to school. It began on the first day of class, very much like many kindergarteners, started with crying, yelling at the other ‘kids’ and hiding under the chair when the teacher called on her. Fortunately, the teacher did not kick the troublesome hound out of school, and though Sophie will always be the food sniffing, counter surfing hound after much, much work she actually passed the test and received her Canine Good Citizen certificate. It’s on my list to share with you… Somehow, I also managed to convince Bob to redo the window and door frames (still a work in progress) to Craftsman style… More pictures and yes, it is another project you can do yourself. Those are for another day. Today I just wanted to tell you that we’re well just endlessly busy with those danged projects. I have not forgotten you. 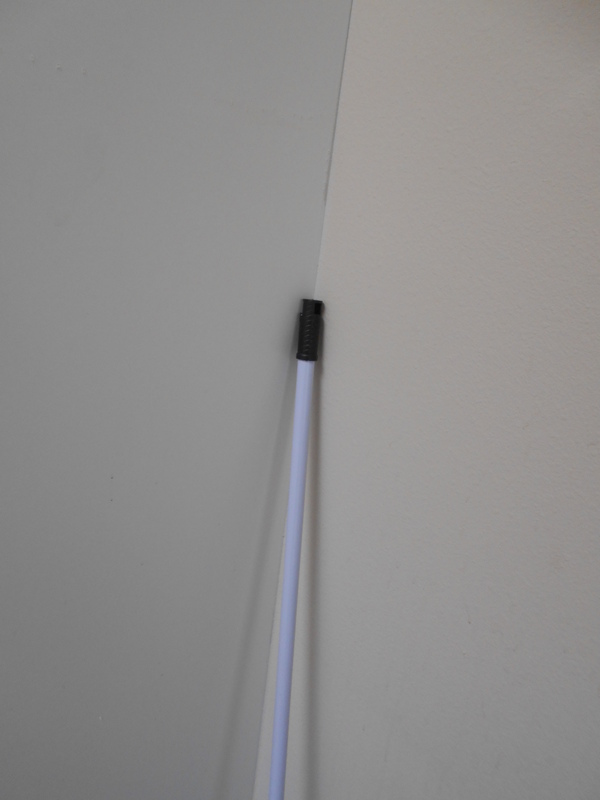 Yes, it was the broom handle in the corner where I had left it. Whew. I survived another crisis. This entry was posted in Uncategorized and tagged DIY, Galileo thermometer, Popcorn ceiling, strawberry arizona. Bookmark the permalink. ← Five Years and I’m a Survivor! Rose, I LOVE your ramblins. I get so relaxed just reading them, that I have to be careful not to read them when I’m supposed to be doing something very important! I need to talk to you and your accomplice about ‘popcorn ceiling’ removal. Do you hire out? I want you to know that I interrupted my Sat. a.m. HGTV to say how great it is to hear from you. I hate that channel, fortunately, my courage and cash never attack at the same time (kno whatta mean?) Can’t wait to compare my daughter’s experiences with removing the ‘popcorn’.! I laughed with relief it wasn’t me!